Years ago a painter gave me some really good advice. We were discussing cleaning paint brushes and I asked him about water temperature. 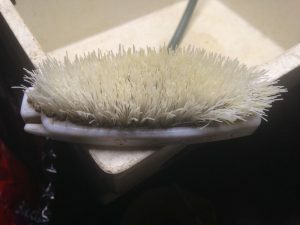 His advice was, “warm is fine, but never let hot water hit the bristles.” I have been amazed ever since at the difference it makes using warm water to clean brushes, compared to cold water. A gentle stroking with a hand scrubber is good for persistent, dried paint. Stubborn, dried paint comes off easily with soap, warm water, and a few strokes of a semi-stiff brush, but always go with the bristles. Another tip: Make that final rinse with an outdoor garden hose. It will blast away any remaining soap. Then hit it with the hose, always in the direction of the bristles, never against them. 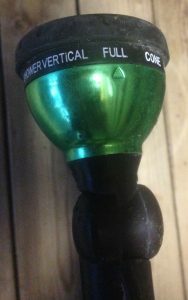 I like to use the highest volume setting on the wand head. On the wand pictured, that’s shown as “bucket filler.” That setting provides a lot of water without the blasting action of one of the jet settings. This wand’s maximum volume setting is called “bucket filler.” A jet-like setting will provide more force, but you want a lot of water flow to wash the soap away and still be gentle. 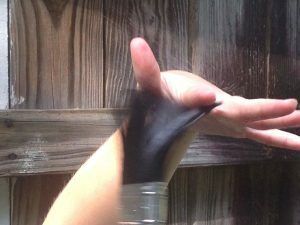 After your last rinse, slap the brush against your fanned-open fingers to dislodge as much remaining water as possible. Spread your fingers as far as you can, then slap the brush back and forth, removing as much water as possible. Afterward, gently shape the bristles again. Brush manufacturers advise us to save the packaging our fine brushes come in. Storing them in the original packaging helps them retain their proper shape and keeps the edge bristles from developing “flyaway hair.” Heaven forbid! Original packaging will always be a perfect fit for storing good paint brushes. To make their storage a little tighter and enforce the shape, I first wrap a little used paper towel around the brush. It helps with absorption and drying, also. If you don’t have the original package, wrap the paper towel around, then keep the towel closed with painter’s tape. Always store brushes vertically, business end down. Standing a brush on its head sends water into the ferrule, where it will eventually cause corrosion and brush failure. 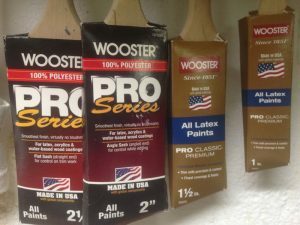 Paint Can Lids – Tips from Sticks in the Mud – October 2017 – Tip #1 POLL: Where Do You Get Your Wood?